Millionaires singer Melissa Marie Green is working on a full sleeve on her right arm and has other smaller tattoos scattered all over her body. 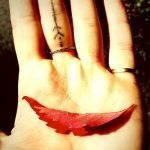 She is also an aspiring tattoo artist and has done a few of her own tattoos. 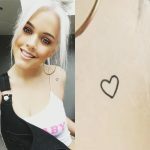 In February 2016 Melissa Marie Green got a tattoo on her stomach which says “Prima Donna” in huge script letters. In Italian “Prima donna” translates literally to “first lady” and describes an opera singer in a a leading role. The term has been co-opted into English to describe someone with a diva-like attitude who is arrogant and vain. Though some might see this an insult Melissa likes to act like a queen bee. 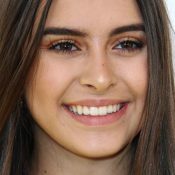 As one half of the pop duo Millionaires, Melissa often sings about being better than everyone else and being high-maintenance. 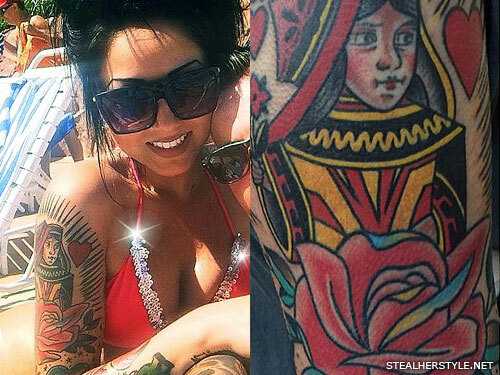 Melissa Marie Green has gotten small tattoos with past boyfriends, but she went big after she got married. She has her ex-husband’s name “Gavin” tattooed on the inside of her left arm, and she tattooed her own name on his chest to match. 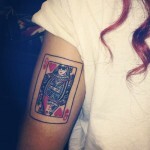 After completing a full sleeve on her right arm this is the first tattoo that she has gotten on the left. “I’ll never settle down…that’s what I’ve always thought. I was that kind of girl. Just ask anyone.” Everyone always says that someone “ties you down” – I mean, sometimes I won’t complain about that ;) – but my husband is the one man that has always supported me in anything and everything I want & ask for in life. I don’t know how I got so lucky to have someone so loving & understanding & trusting. I want to be honest – I’ve made some horrible mistakes in the past & abused his trust & it wasn’t worth it one bit. I didn’t believe that someone could really love me for ME. Even now, it’s about to be 6 months of being married & we realized we won’t be able to spend it together because of my career. I know that probably sounds cheesy but I don’t think people realize how appreciative they should be to get the chance to spend those stupid little dates & momentous occasions with the people they love. I cherish every second I get to spend with Gavin ❤️ Right now we’re 8 hours in time difference but when you read this baby just know I’m thinking about you & I can’t wait to see you soon. I love you. 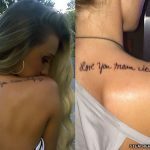 Melissa Marie Green shows her love for her father with this “Daddy” tattoo on the back of her right hand. 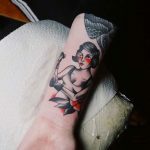 Artist Mikey Tedesco used the American traditional style technique and color palette for the design, which features a red heart with a banner and two yellow flowers with black leaves. This is the first large piece on Melissa’s hands, added in April 2015, and it is connected to her existing full sleeve with dots and stars. 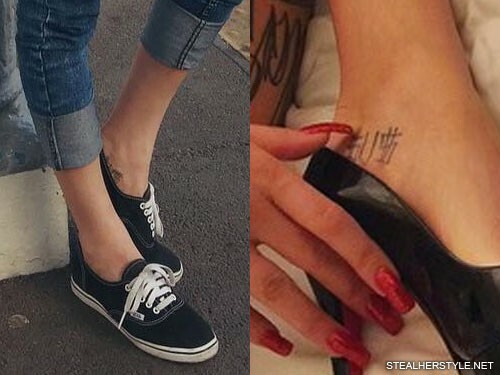 Melissa Marie Green gave herself this “$U$” foot tattoo which matches her sister Allison Green. Sus is slang for “suspect” and is used to describe someone or something shady. 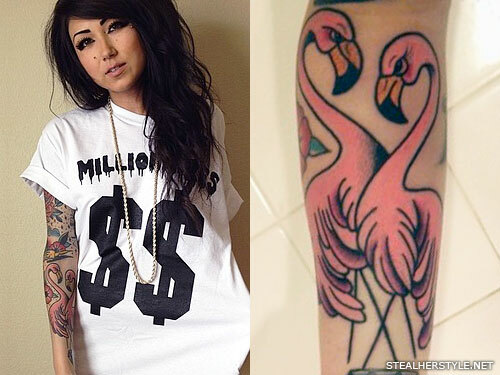 Melissa Marie Green has two small dice tattoos in her right arm sleeve, in between her dollar sign and flamingo tattoos. She hasn’t spoken about this tattoo specifically, but we know how much she loves spending time in Las Vegas — America’s gambling capital. 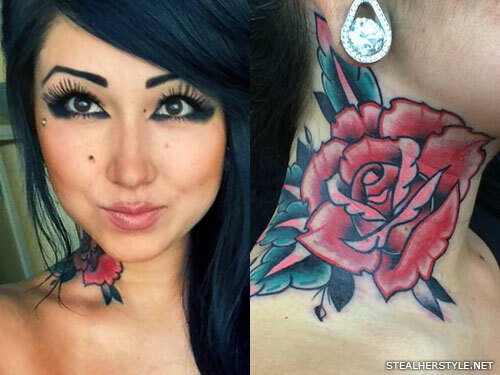 Melissa Marie Green got a large pink and red rose with leaves tattooed on the side of her neck by artist Mikey Tedesco in August 2014. Artist Mikey Tedesco took over the coloring of the tattoo, beginning with the rose at the bottom in January 2014. He redid the black outline making it thicker and colored in the rose with red ink, using blue and yellow on the underside of the petals for contrast. He writes “Did not start this piece but redoing it all started with the rose :)” He completed the coloring of the queen of hearts at a separate session in February 2014. Melissa Marie Green got this pair of candy conversation hearts tattooed on her elbow in May 2014. The blue heart has the initials “J.P.S.” for her boyfriend at the time, Joshua P Schlienz, and the pink heart says “XOXO” for hugs and kisses. 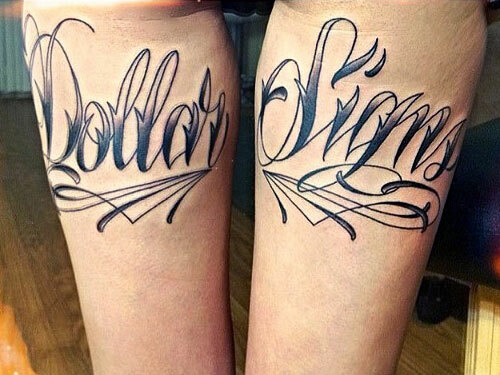 Melissa got the words “Dollar Signs” tattooed in large letters across the backs of both thighs in March 2014. Melissa had another outline added to her sleeve by Jesse Mora in August 2013, this time of a pair of flamingos on her forearm. Mikey Tedesco filled in the colors in January 2014. 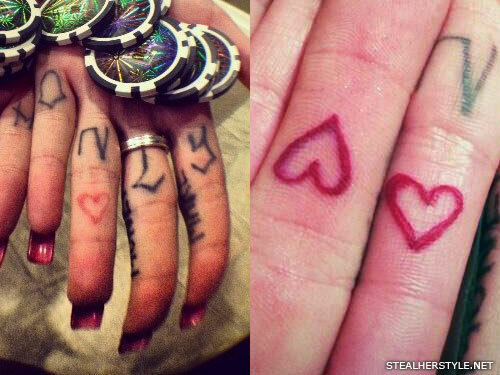 Melissa Marie Green and her then-boyfriend Oscar Wylde got matching red heart tattoos on the insides of their ring fingers in November 2013. 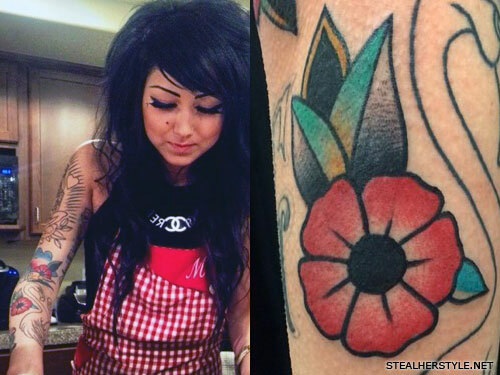 Melissa Marie Green filled in an empty space in her sleeve with this red flower with green leaves between her flamingo and “AMG” tattoos, done by Mikey Tedesco in December 2013. 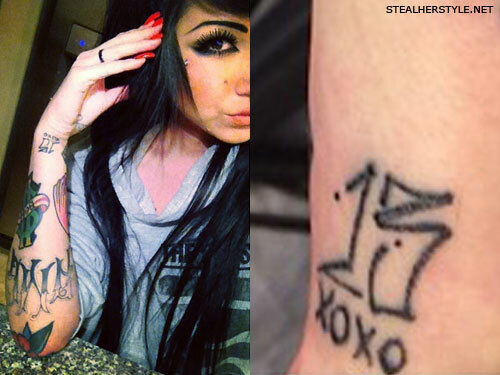 Melissa Marie Green got this “13 XOXO” tattoo on her right wrist from artist Mikey Tedesco in December 2013. 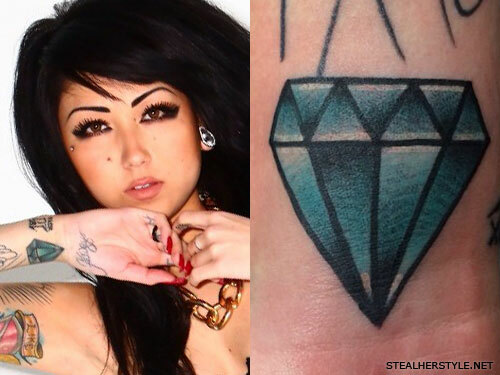 Melissa Marie Green got this blue shaded diamond tattoo on her right wrist from artist Mikey Tedesco in December 2013. 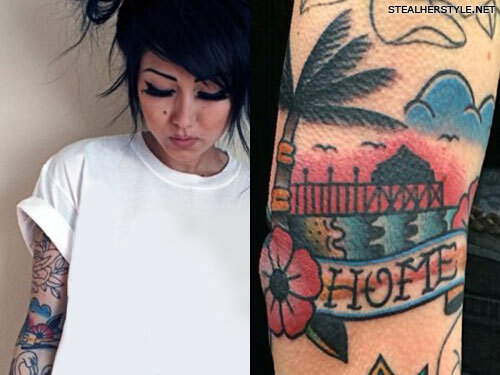 Melissa Marie Green commemorated her hometown of Huntington Beach California with this tattoo of a palm tree, ocean pier, and the word “Home” on her elbow, which was done by artist Mikey Tedesco in December 2013. 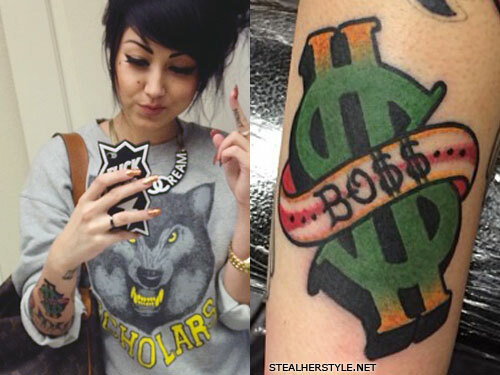 Melissa Marie Green has a tattoo on her right forearm green dollar sign with the word “BO$$” in a banner across it, done by artist Mikey Tedesco in December 2013. 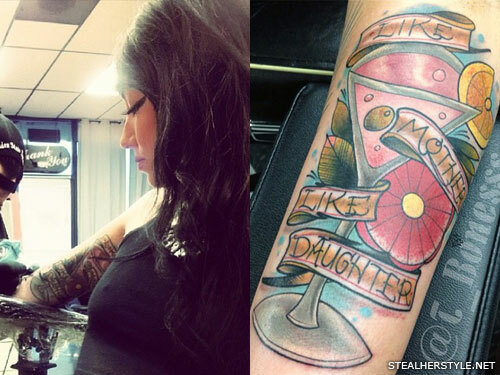 Melissa switched tattoo artists for the “Like Mother Like Daughter” martini glass tattoo on the inside of her upper right arm, her first full-color tattoo. Tony Linville of GoodFellas Tattoo did this piece in September 2013. 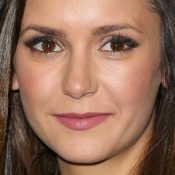 Melissa is extremely close with her mom and they enjoy drinking martinis together. 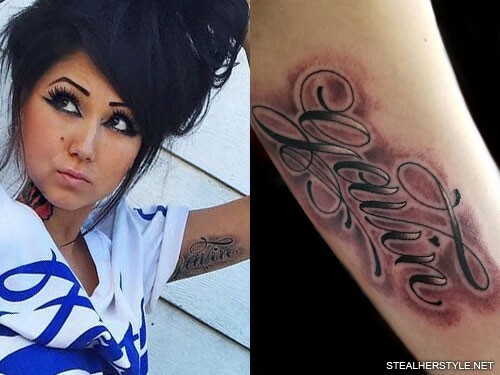 Melissa Marie Green got a tattoo on her elbow of her sister Allison Maria Green’s initials “AMG” done by Jesse Mora in June 2013. 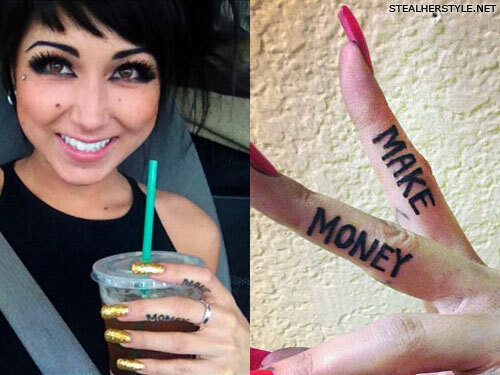 Melissa Marie Green gave herself this “Make Money” tattoo on her index and ring fingers on her left hand. Melissa Marie Green has the saying “I do what I want” tattooed on her left thigh. 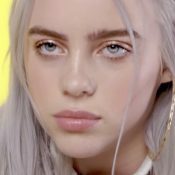 It describes her philosophy on life and is also a reference to the Millionaires lyrics “I do what I want, middle finger in the air, gonna party party party like a millionaire” from the song “Party Like A Millionaire.” She did the tattoo on herself in July 2013. 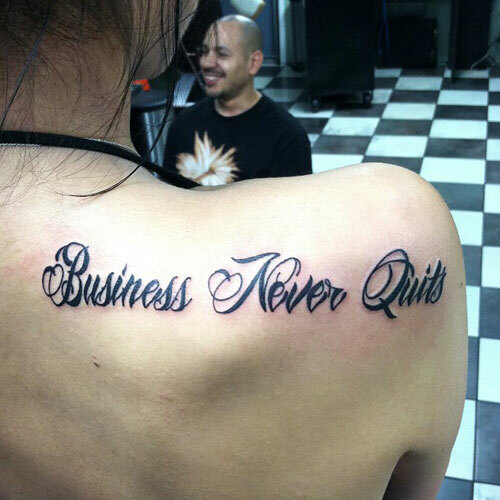 Melissa Marie Green got “Business Never Quits” on the right side of her back in June 2013. Business Never Quits is a slogan often used by the Millionaires and Allison has it tattooed on her foot. It was done by artist Jared “Tattooface” Wright at Dreams In Ink Tattoo in Moreno Valley, CA. 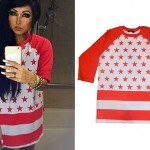 Melissa Marie Green got “Ca$h Only” tattooed across the insides of her fingers in June 2013. 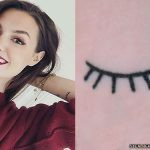 She had fake tattoos in the same location for the cover of Millionaires’ Cash Only EP. Melissa traded tattoos with artist Jesse Mora and gave him a tattoo on his hand. Melissa Marie Green got this tattoo on her her right foot of the word “Homesick” done by artist Marcos Ortega at Careless Tattoo in Berlin, Germany in May 2013 while Millionaires were on tour. In March 2012 Melissa Marie Green tattooed her knuckles on one hand with ultraviolet ink, only visible under UV light. 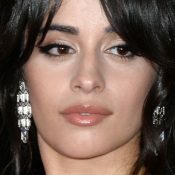 The symbols are: the “LV” symbol of luxury brand Louis Vuitton, a heart, a letter “A” (probably for her sister Allison), and a dollar sign. 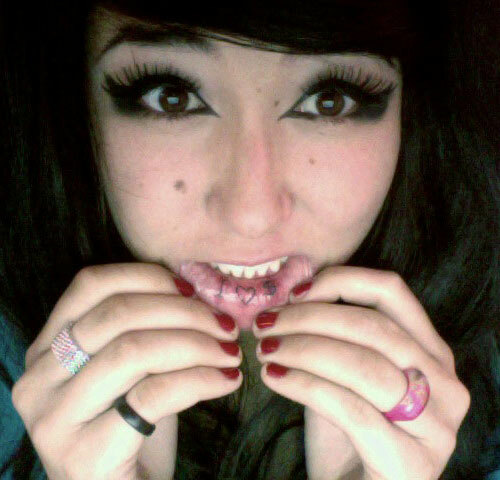 Melissa Marie Green’s first tattoo was “I ♥ $” (I Love Money) on the inside of her lip. 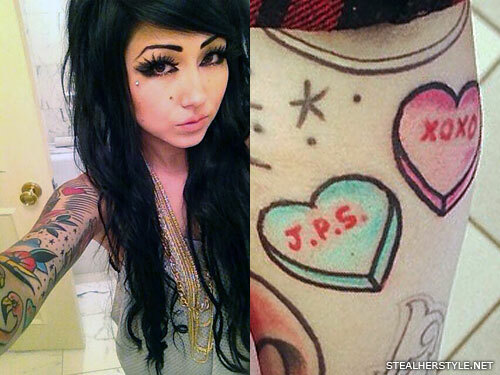 She got this tattoo in the summer of 2009 while Millionaires were on Warped Tour. 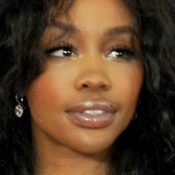 Because lip tattoos wear off easily, Melissa had this tattoo retouched in January 2011 while her sister Allison Green was getting her first tattoo, also in her lip. 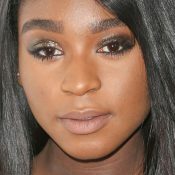 Shes gotten more tattoos btw. 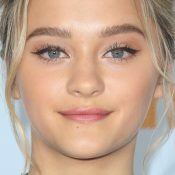 i dont think you guys should be leaving bad comments. 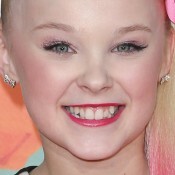 she can do what she thinks is best for her!like Cher Lloyd. she has lots of tats. 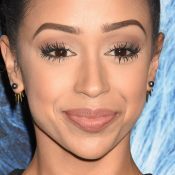 Melissa has finger tattoo’s also now. Could you add them too? Lips tattoos wear off very easily. It won’t be there forever. Plus, it’s inside of your lip, who sees there! I have nothing against these girls,but is that really something you want for the rest of your life?